We install tiled conservatory roofs across… Warwick, Royal Leamington Spa, Kenilworth, Wellesbourne, Stratford-upon-Avon and Warwickshire. A magnificent vaulted, plastered ceiling provides you with the opportunity for complete harmonisation with your connecting room and décor. We are able to offer you a tiled conservatory roof that is easily tailored to suit your specifications. With this in mind, it won’t matter if your home is modern, traditional, period, heritage, or new build, we’ll be able to offer you something that will complement your existing architecture perfectly. Your tiled roof can be supported by traditional conservatory walls or stone or brick pillars and incorporate your choice of doors and windows. This means that it upholds an impressive degree of installation versatility, allowing you to capture a new living space that both looks and performs exactly as you want it to. Further to this, the flexibility also serves to minimise installation time as it allows us to cater for a wider range of project specifications. Superior insulating performance to a traditionally built roof ensures you stay warmer in the winter and cooler in the summer; achieving a 0.18 W/m²K U-value. With this in place, you’ll be able to avoid the ‘oven’ and ‘freezer’ effect that is usually associated with outdated conservatory designs. In short, you won’t have to worry about your conservatory becoming unusable during seasonal peaks: making it a worthwhile investment for your home. Create a lasting impression of an investment well made with our conservatory tiled roof conversions, resulting in a sleek, superbly insulated room you will use all year round. 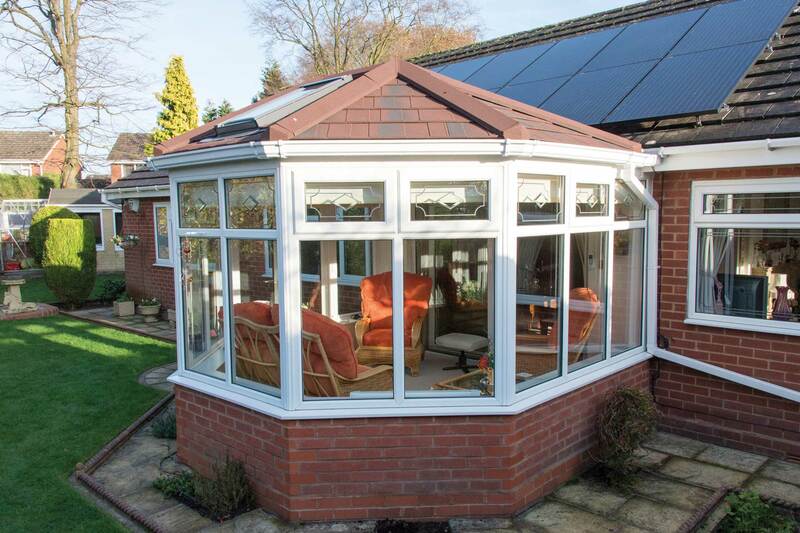 Whether your home is modern or traditional the addition of a tiled roof to your conservatory will complement it perfectly and transform it into a sun room that is warmer in winter and cooler in summer to ensure you create a living area that you can use all year round. Our innovative tiled conservatory roof system extends your living space in perfect harmony with your home to give you the most loved room in the house. 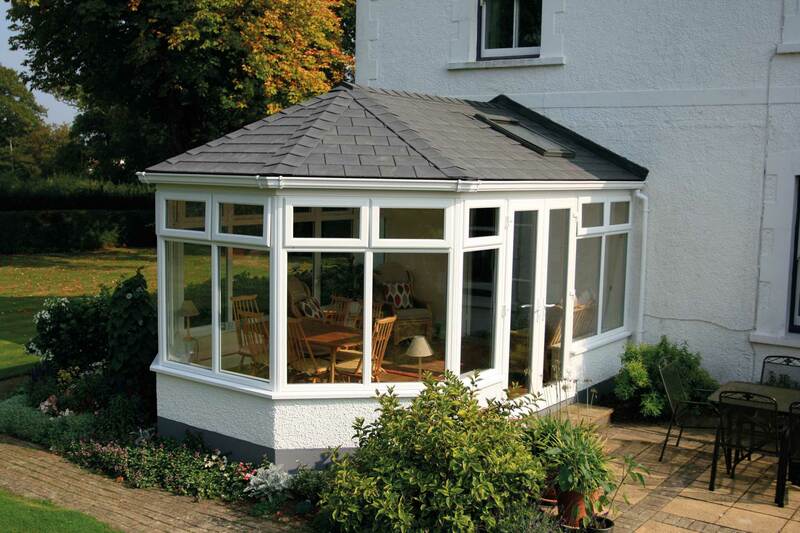 It can either be used on a new built extension or to replace your existing conservatory roof. It creates a spectacular, spacious vaulted ceiling on the inside, whilst matching the existing tiled roof finish on the outside. 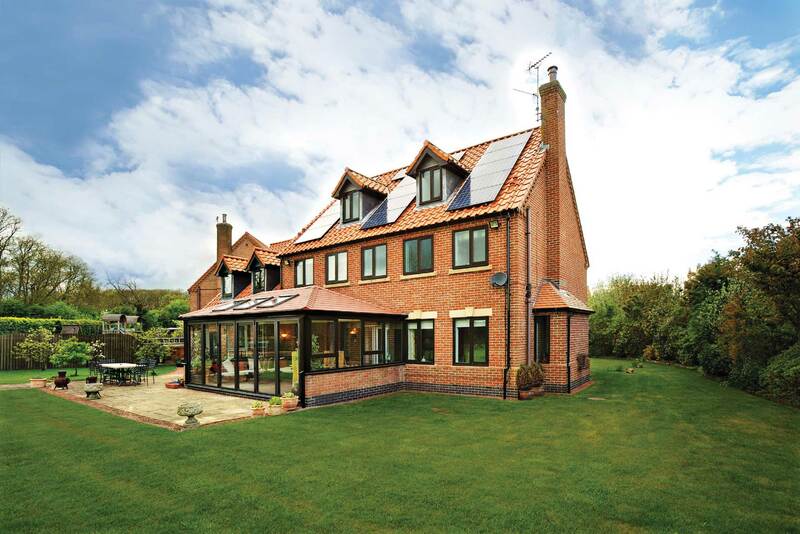 It out performs a traditional conservatory roof in almost every way. 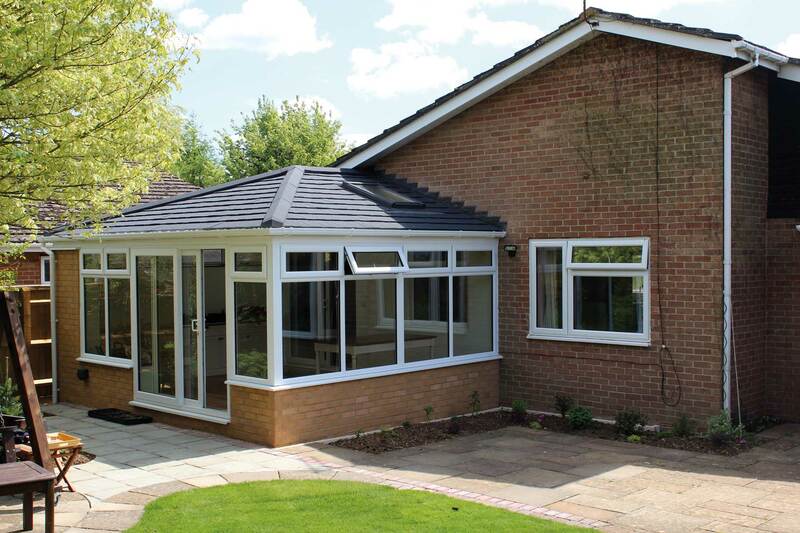 Investing in a contemporary tiled conservatory roof not only brings an aesthetic value, it also works to increase the overall heat retention of your property too. With one of our professionally installed roofs combining with industry-leading windows and doors, you can rest assured that you’ll be able to keep the warmth from your central heating in your home for a longer period of time. As a result, this means that you could find yourself saving money on your heating costs too. Minimise building control checks by choosing a LABC registered system. With this in place, you can rest assured that you’ll be able to bring a new roof to your home that is set to last the test of time. The approval from an independent governing body is a demonstration of our commitment to ensuring we offer you the very best designs for your home. With this in place, you can rest assured that your new roof will continue to bring lasting value long after installation. A range of tiles for perfect harmony with your existing property, allowing you to bring the best out of your personal tastes and your existing property architecture. You can bring daylight deeper into the room to make it larger, brighter and more homely with a range of beautiful roof options: allowing you to let natural light in without letting the elements in. With Warwick Glass and Glazing, you can enjoy the best of both worlds. 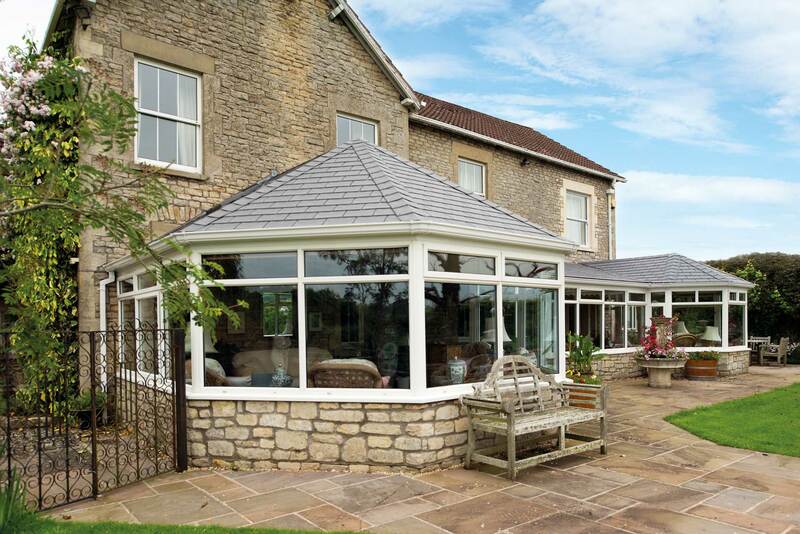 Although our tiled conservatory roofs are inspired by a traditional design, they do not uphold any of the problems that usually accompany an older design. With this in mind, you won’t have to worry about our tiled conservatory roofs needing constant upkeep to look and perform at their best. You can also rest assured that their structural integrity won’t be compromised by a poor design that can’t stand up to the elements. Visit our online quoting engine to get a free, instant, and highly competitive tiled conservatory roof prices. Simply input your details through the step by step process to get a tailored price that has been tailored to your specifications.